What do we actually know about Sledgehammer’s new Call of Duty multiplayer foray? As we edge closer to the official release date of Call of Duty: Advanced Warfare, 11.4.2014, Activision and Sledgehammer are continuously captivating the attention of the community through a multitude of insights into the game and its features. Up until now, we have witnessed several trailers revealing the unique technological evolution of warfare created to establish and enhance the immersive nature retained through the development of next generation gaming. However, as the majority of this gameplay is extracted from the campaign of Advanced Warfare, there is little information available regarding the highly anticipated multiplayer aspect within the latest instalment of the Call of Duty franchise. 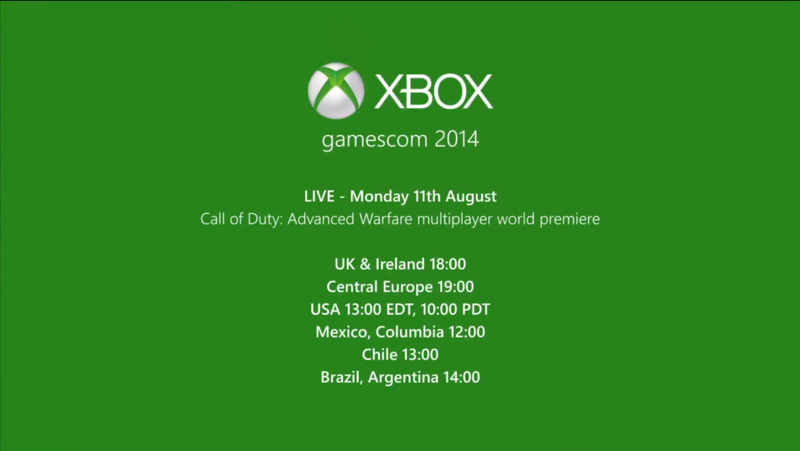 Nevertheless, it has recently been announced that during Gamescom Cologne 2014 Activision will host the Call of Duty: Advanced Warfare multiplayer world premiere on Monday the 11th of August. Although avid Call of Duty fans will have to patiently wait to further their knowledge of the multiplayer features within Advanced Warfare, at this moment in time, Activision have released an agonisingly short multiplayer teaser at the end of their most recent campaign trailer to quench our longing for visible gameplay. 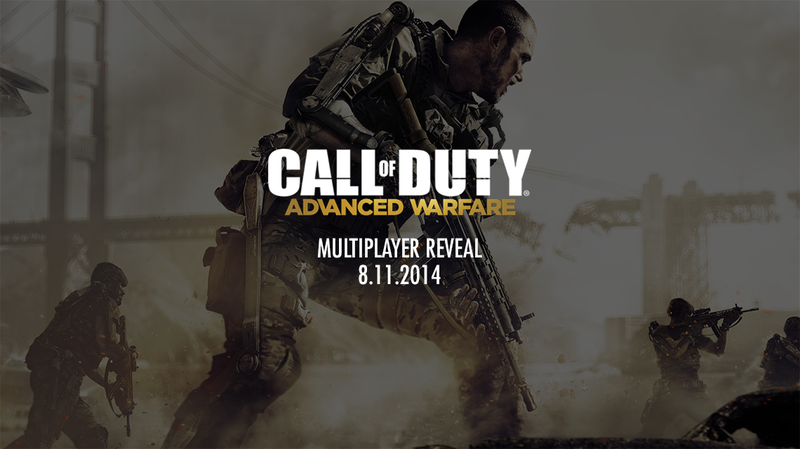 Upon first observation, one may claim that this snippet of multiplayer footage reveals a limited amount of information surrounding the online features of Advanced Warfare. However, a detailed analysis of the trailer provides us with a significant amount of data. As a result we are able to construct a general idea of what to expect heading into the multiplayer reveal, and subsequently we have constructed a list of the most intriguing aspects of Advanced Warfare thus far. 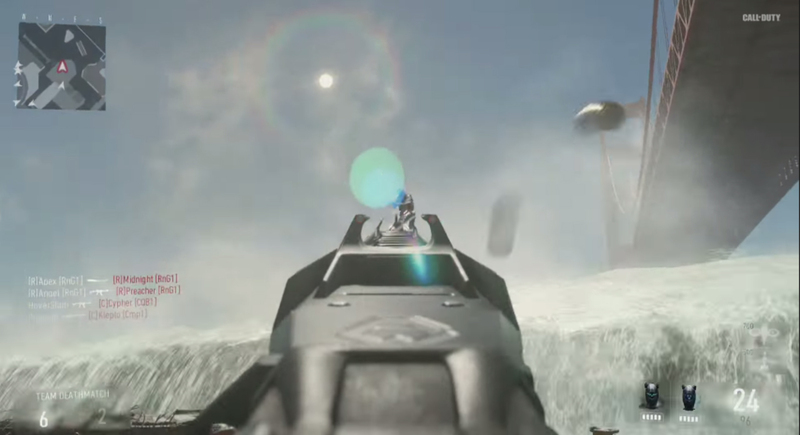 Arguably the most astonishing factor noted from the multiplayer trailer can be seen through the use of a contraption that highly resembles a Jet Pack. Within the fragment of available footage, we witness a player jump in the air, boost himself and consequently fly backwards over a platform as a means to evade another player following him. In addition to this, we also observe a player use his boosters to swiftly launch himself in a horizontal fashion whilst engaged in a gunfight. Although it is uncertain whether these abilities will make its way into competitive Call of Duty, they nonetheless hold the potential to revolutionise the franchise as we know it. Gun fights, jump shots and turns ons will be elevated to a whole new level as players are seemingly able to boost their character in every direction. First introduced within Call of Duty Ghosts, the long awaited capability to customise one’s soldier returns in Advanced Warfare. Previewed in the images above and confirmed through the pre-order bonuses, players are seemingly able to customise the colours of their characters exoskeleton, with brown and red suits already apparent. Typically, with the launch of a new segment in the Call of Duty franchise we witness a complete overhaul of the user interface. Although there has been no confirmation of what the multiplayer menu itself will look like, we have been issued with a preview of the in-game aesthetics. Immediately, one may notice that Sledgehammer have opted to revert to an interface familiar with the earliest releases of the Call of Duty franchise. 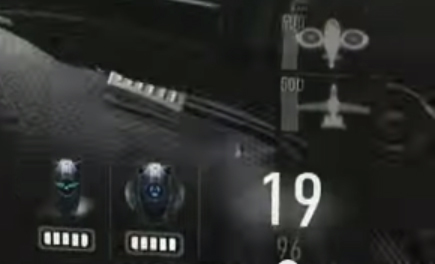 The kill feed has been restored to its original position in the bottom left hand side of the screen, the mini map has returned to its normal size and the scoreboard no longer displays the tally of kills in the form of points obtained but rather the number of kills themselves. Having made their introduction into the franchise in Black Ops 1, dynamic maps have provided Call of Duty with a means to further the games potential while also creating an entertaining tactical scenario. 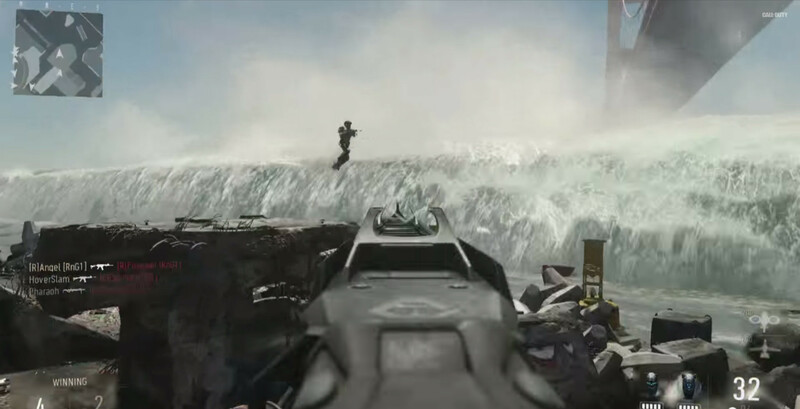 Within Advanced Warfare dynamic map events appear to retain their existence within the game, as we observe a large wave approaching the shore of the map in the provided multiplayer footage. Using our knowledge of previous titles, we assume the incoming tidal wave will be used to isolate parts of the map, while granting access to others. Players will have to strategize their movement appropriately around the lethal hazard, ensuring they are best positioned upon the arrival of the natural disaster. With every new instalment in the Call of Duty franchise a plethora of new weapons and perks are immersed into the arms of the eagerly awaiting public. Although we have no official confirmation upon the name and statistics of the weapon used within the multiplayer trailer, we are able to gather sufficient information to provide you with our speculation on its details. 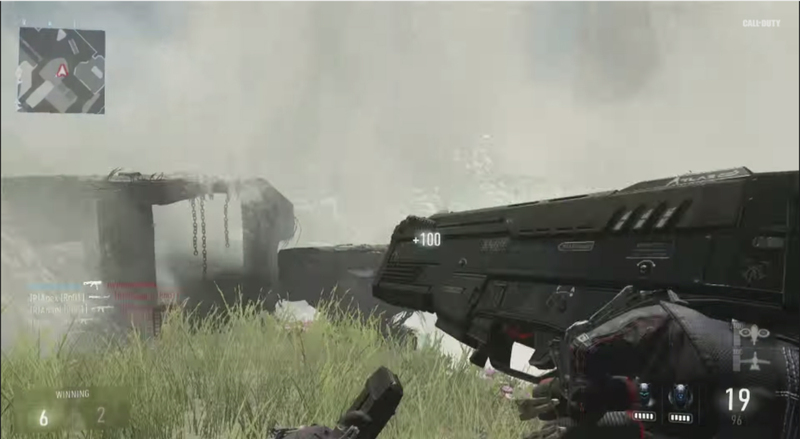 The weapon itself seems to be a submachine gun, constructed by the Private Military Corporation, Atlas. It features a 32 bullet magazine and seems to operate efficiently at a short to medium range. Even though there is a lack of perks apparent within the footage, one may notice the inclusion of two unfamiliar icons in the bottom right hand corner of the screen. At this moment in time we are unable to confirm the reasoning for these icons, however as there seems to be 5 charges available per icon, we assume they hold some correlation between a player and the abilities of their exoskeleton/jet pack.